He waited patiently in his crate for Uncle Manny to return from his first chukar hunt of the day, no yips, yelps, or whining. Manny once again did a stellar job, finding and holding birds for our sorry shooting. Everything shot was picked up and returned – I do not deserve that dog. I’m still taking it easy with him as his broken toe is still vulnerable, so after an hour, Flick is up. New country, new hunter in my friend Joe, and hopefully, a chukar to acquaint the pup with the wonderful world of game birds. Flick covers ground in a miniature version of his uncle’s style – investigating objectives, moving to the front, and checking in visually often enough to keep me somewhat confident he’s not going to run off into the sage. Feather piles, old scent and distant birds all did what they should, prompting puppy points. More questing and eventually, the real thing: a quivering, leg-up point – for a moment. Bird up! Bang bang! A clean miss and the perfect training scenario. Even with a 20-foot checkcord, I couldn’t get to Flick fast enough to forestall a chase, so I was glad Joe had blanked. Flick was reminded he could not catch birds he busted. But he’d met his first chukar. His pace quickened, steely puppy eyes searching for more objectives and his little nose up and inhaling scent as if he’d just discovered breathing. A couple more similar scenarios and eventually the pieces fell into place. Little tail up, leg cocked, nose telling us exactly where the bird hunkered. Checkcord grabbed, hand-over-hand to the pup, firm grip and belly rub, and explosive flush ending in a dropped the bird. 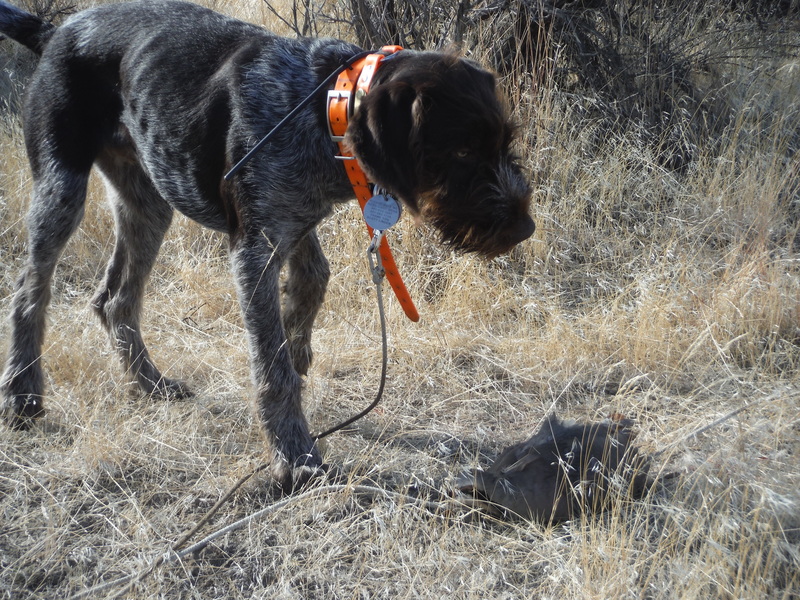 Released to retrieve, Flick effected a spirited dead bird search and after another point, got an up-close snort and taste of chukar. Welcome to our world, Flick.